It was nearly dawn, and very little starlight remained to illuminate their way, but outside their house there were still working streetlights on a few corners, pooling soft yellow light. Mhumhi and Kutta avoided them, sticking to the shadows. Mhumhi was really beginning to feel the helplessness of their situation. Limping, smelling like blood, trying to pant softly… If another one of those awful creatures found them, there would be no way that they would survive. They had both agreed that it would be best to cut a wide angle around the light post where Mhumhi had gotten caught in the wire. Not that Mhumhi really thought it would help, in the end- why would the creatures stay there? As he limped along, he suppressed a shudder. Part of him wanted to go back, just to see, to look- to see if anything was left there. He had to quell such thoughts. He had held them about his mother, the thoughts that held aloft that strange and horrible hope, and they had gotten him nowhere. Sacha… had been right, it was not good to hold on to them. He whined, the noise unbidden. Mhumhi licked his lips and followed her without saying a word. They moved slowly through the sleeping city. Mhumhi thought he saw eyes gleaming in a storm drain once- it might have been a fennec fox- but they vanished at once. The warm night air lay heavily on them, wind mingling scents together. Mhumhi was certain he could smell traces of the musky scent of those things, but it could have been from earlier, it could have been from a different direction, he did not know. At least it did not seem that it had come from anywhere close by. Before he would not have even taken notice of the smell; he’d have assumed it was just another dog, but now it was firmly ingrained in his psyche. There was that, at least. They wouldn’t be caught unawares again by something that smelly. “There’s the subway,” Kutta whispered to him. The pale white building was suddenly looming out of the darkness in front of them. Mhumhi saw the sheet metal that had been blocking the little entrance he’d found, though now it was lying on the ground. Cutting through the darkness they suddenly heard a noise: a moaning call, rising up like a question. “No,” said Kutta, her tail tucking in fear. They darted together into the little gap in the wall, into the total darkness of the subway. “Oh, no,” Kutta moaned, when they had both come through to the other side. Mhumhi’s tail tucked too, in the darkness. The interior of the subway reeked with monster. Mhumhi could smell its marks, its urine and feces, and the heavy musk of its markings. There had been more than two individuals in there- the smell was so strong that there was no telling if there were any in there even now. Kutta made no sound, but he heard her stumbling forward in the darkness, claws tapping on the tiled floor. He followed, vaguely remembering the layout from the time he had come there seeking his mother’s scent. There were pillars- the trench of the track- the familiar rushing sound of air passing through long tunnels. He nudged Kutta towards the way down, a pile of old debris piled up against one side of the deep track, and they slipped and stumbled down together. If there was anything in the tunnel, it knew it wasn’t alone now. Mhumhi hoped they were alone. He kept his nose near Kutta’s tail and followed her as she limped down the track, half-tripping over the metal rails as he came across them in the blackness. The smell of the beasts was not getting any lighter- they had been all along this area, even far past the station where they had climbed in. Both of them kept quiet, the sick feeling still rising in Mhumhi’s chest. It was like they had come into a nest, a nest of them right within their boundaries. “Here,” whispered Kutta, and he heard her claws scratching. He nosed up beside her and felt his nose touch crumbling stone. Mhumhi followed her over, his paws slipping on the loose shale. At the top he had to squeeze past a shattered part of the concrete ceiling, his back brushing up against it as he crouched. His injured leg dragged and caused him a burst of pain, and he had to stop for a moment, shuddering. Kutta gave a soft chatter of encouragement, and Mhumhi went on, slipping down the other side, hearing rocks he had disturbed bounce and fall in the darkness. When he reached the bottom, he felt a soft wind. He turned towards it, sniffing. The smell of the creatures was still very strong, but he also smelled something else, something he was not familiar with. There seemed to be a broad opening near him that the wind was blowing through. He turned towards it. Mhumhi followed her over to another part of the pile and heard her begin scratching at it. Mhumhi went to stand next to her, sniffing dubiously at the rubble. He could indeed catch a whiff of sewage. He began to help her dig, shifting the larger rocks with one paw, as it was hard to use both with only one good hind leg. After a little while, his nose detected an influx of cold, smelly air. He thrust his head forward and was able to detect the beginning of large pipe, just barely big enough for a dog to get through. He heard more stones sliding from her efforts. He sneezed. The air was getting very dusty from all their efforts. His sneeze echoed a bit, and then there was a response: a moaning whoop. He felt Kutta freeze next to him. “Hurry,” he said, and then they both began to dig, side by side. Behind them they heard paws thudding on metal and that eerie chattering laugh echoing. “It’s clear, it’s clear,” Kutta gasped, and she crouched and crawled inside. Mhumhi, panting, looked back in the darkness as he waited for her to squeeze inside. The sounds were coming in with the wind drifting from the large opening behind them. They were very close. The metal around them vibrated as claws scratched at the pipe. Mhumhi felt a nose bump his exposed rear. He tucked in his tail and heaved himself forward, heedless of the pain in his leg. He bumped into Kutta, who gave a frightened squeal. Sh moved forward, agonizingly slowly- he knew she must be in pain too from her shoulder, but there were monsters behind them. He felt the pipe shudder again from their pawing, and then with a nervous chattering laugh one shoved itself through the pipe. Mhumhi felt its breath on his rear, heard it snuffling and sniffing like a blind mole for his presence. He nipped Kutta’s tail in his desperation to get away, and she jumped and dragged herself forward. Behind them the creature gave a squealing whine and made the pipe rattle as it withdrew. “What’s that, what’s it doing,” cried Kutta in front of him. She did, panting and gasping, and they squeezed forward through the narrow circular darkness. The chattering and moaning noises of the beasts faded away behind them. It seemed like another eternity that they had to crawl together through that close pressing darkness, occasionally feeling the pipe shudder again from far away, and hearing the echoing sounds of moaning whoops. Suddenly Kutta gave a little cry, and her warm presence vanished from in front of him. 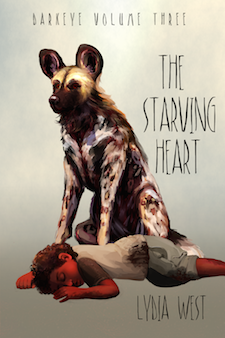 “Kutta?” Mhumhi squirmed forward and suddenly his nose and forepaws were encountering empty air. The remainder of his body followed, slithering out with a painful thump a foot or so down onto hard concrete. “Are you all right?” said Kutta, coming to nose at him. He blinked, for he was beginning to be able to see again in the dim light. They had landed in a sort of concrete trench in an area where the sound of rushing water was very loud. He stood, shaking a bit, and was able to look across a metal railing to a vast, murky pool of water, lit by a few dangling spotlights. He recognized the place. It was the big reservoir in the sewers next to the corridor where the hulker children hid. Only they were at the bottom of it now. “I don’t know how you thought we’d do that,” muttered Mhumhi. “I want to know what happened to Kebero and Bii,” she replied, tone cool, and he had nothing to say to that. They went up the spiraling stair, step by aching step, until they finally rejoined the path they took through the broken grate. Mhumhi thought the narrow concrete hallway looked like heaven, especially since the door was hanging partly open and golden light was spilling out. Mhumhi thought he’d never been more gratified to see anything than Maha’s tangled head poking around the door. Kutta tottered up to her, tail wagging, but Maha leaned back fearfully, her white-sided eyes wide and fearful. “What’s the matter?” Kutta asked, her tail slowing. Mhumhi limped up beside her. Maha looked at him, her eyes flicking over him, and then her face screwed up and she gave a kind of wail. Mhumhi flattened his ears and actually took a step back. She was rubbing her face, which seemed to be getting damp and sticky, with her forepaws now. “‘M not hungry,” said Maha, the words muffled through her hands as she continued to wipe at her face. Kutta gave Mhumhi a worried look, and Mhumhi limped closer so he could paw at her knee. Maha gave another wail and knelt to grab him around the neck again. Mhumhi went all stiff again as she buried her face in his fur. It was extremely damp. She was saying something, but it was too muffled into his fur to hear properly. Mhumhi looked back over at Kutta and saw that she was grinning at him. She let him go, sitting back on her haunches to sniff and wipe at her eyes, and he breathed a long sigh through his nose. Maha gave kind of watery giggle then, looking slightly guilty, and stood up. They walked into the room together. Maybe a little blood thirsty, but really, what else are the police for but dealing with things like that?